Geek Lit Etc. : Manga Monday: Is fooling around genetic? Manga Monday: Is fooling around genetic? Seki shows that he truly has no shame in My Neighbor Seki Volulme 5. 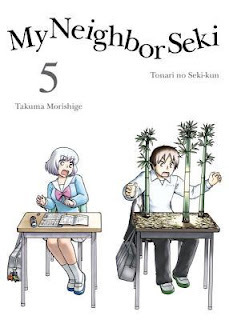 Note: My Neighbor Seki Volume 5 is part of an ongoing series. Check out the review for Volume 1 here, and Volume 4 here. Otherwise, read on! It's one thing to fool around in a normal class, or during a field trip. But Seki takes it to a whole new level in 60th Period. Here, it's Parent Visiting Day, and the back of the classroom is lined with the mothers and fathers of the students in class. One of the ladies looks suspiciously like Seki, and has come...armed with rubber bands? 64th Period brings a completely new type of distraction. Seki's brought polymer clay, and is fashioning...a leek? Oh, they're mascots for the town! Will Yokoi's choice win the honor of representing the town? 66th Period brings another field trip, this time with the Robot Family! It's a multi-day trip, and Yokoi is determined to get a photo of the family enjoying their vacation. Will she succeed in her mission? It's truly amazing that Takuma Morishige hasn't run out of ideas for ways that Seki can distract himself, both inside the classroom and out. Even five volumes in, Seki can still find ways to keep both himself and Yokoi distracted in the classroom. And that takes some amazing creativity. Highs: Poor Sakurako...she just never gets it right. Lows: The stories tend to better as one-shots, rather than the longer connected periods of the field trip. Verdict: If you've liked it so far, it's more of the same high-quality antics.